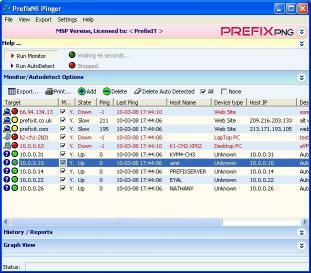 PrefixPNG - powerful and user-friendly application for easy network monitoring. Recieve immidiate notification when any I.P. Connected devices wakes up or goes down Easily monitor your computers printers websites webcams and many others. Recieve an immidiate notification on-screen nor e-mail. With PrefixPNG you can easily configure which devices you can: Easily configure monitord devices Ping of all devices in parallel at once Recieve an Instant notification regarding any changes and much more!